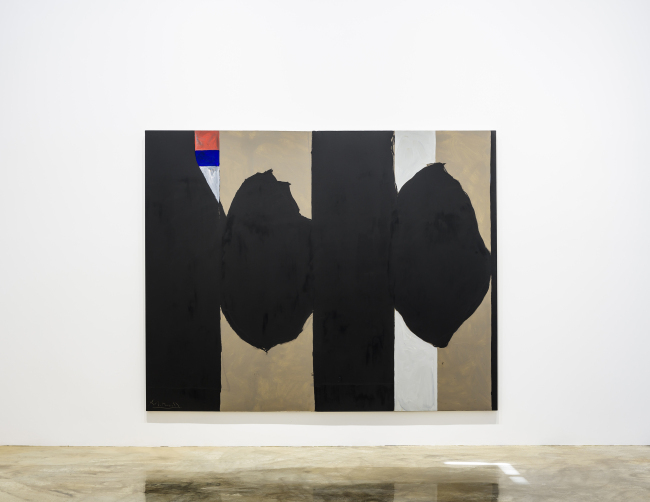 Barakat Contemporary, Seoul-based Barakat Gallery’s modern and contemporary art venue, is introducing works by artist Robert Motherwell. The exhibition kicking off Wednesday will feature 23 artworks that Motherwell produced between 1958 and 1985, including those from his iconic painting series “Elegy to the Spanish Republic,” largely characterized by ovoids and vertical beams. Works on display include Motherwell’s “Elegy to the Spanish Republic No. 130” (1974-1975) and “A View No. 1” (1958), which was previously shown at many prestigious galleries and museums, such as the Museum of Modern Art, New York and Whitechapel Art Gallery, London. The Barakat show is the first solo exhibition of the master of abstract expressionism, whose works are not often seen in Asia, as the artist is relatively underrated compared to his peers, according to the gallery. Hara Museum of Contemporary Art and The Hakone Open-Air Museum in Japan are the only public art institutions in Asia that hold Motherwell’s works, the gallery added. “Motherwell was an artist with many talents. He was not only a painter but also a leading intellectual. His overarching presence in many fields, perhaps, could have overshadowed his talent as an artist,” said Yoo Jin-sang, a professor at Kaywon University of Art and Design. Born in 1915, Motherwell is a seminal abstract expressionist artist, who made great contributions to the New York art scene starting in the 1940s. The artist first moved to New York City to pursue his graduate studies with Meyer Schapiro. Through Schapiro and others, Motherwell met a group of Surrealist artists in exile in New York during World War II, among them Kurt Seligmann, Marcel Duchamp, Max Ernst, Roberto Matta and Andre Breton. The artist was one of the promising young artists encouraged by Peggy Guggenheim, along with Pollock and Mark Rothko. In 1943, Motherwell, together with Adolph Gottlieb, Rothko and Ad Reinhardt, held an exhibition at Guggenheim’s Art of This Century Gallery in New York. The following year Motherwell held a solo exhibition at the same venue. Motherwell was also a leading spokesman of the New York School -- a term he coined for the association of a number of artists based in New York City between the 1940s and 1950s, such as Pollock, Rothko and Willem de Kooning. Starting in 1945, Motherwell became a faculty member of Black Mountain College, where he taught artist Robert Rauschenberg and Cy Twombly. Though the “Elegy” series started as a tribute to the short-lived republic that saw its demise in the Spanish Civil War, the paintings were more of the artist’s personal statements, the gallery explained. 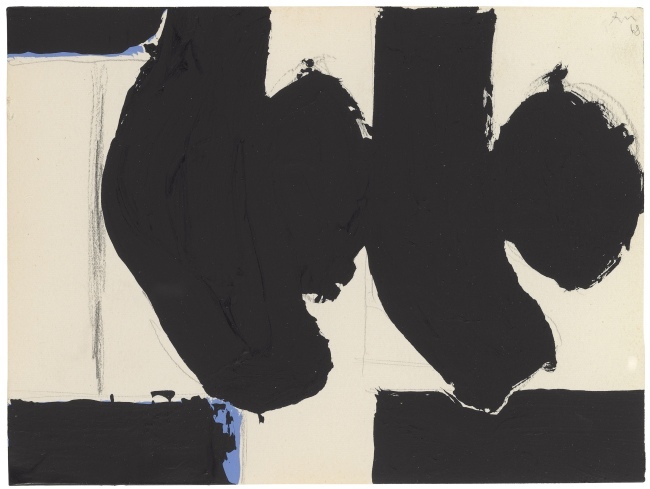 “Painting is a medium in which the mind can actualize itself,” Yoo said, quoting Motherwell, as he explained “automatism,” Motherwell’s painting technique. There are more than 200 “Elegy” paintings. “Mourning Elegy,” the last work in the series, was completed a few months before his death in 1991.